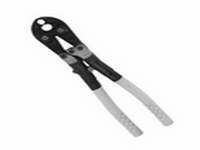 Greenlee K111 Crimping Tool - Full-cycle mechanism assures that crimps are complete. Greenlee K425 Manual Crimping Tool includes selected die grooves. Huskie CN-258 6 Ton Compression Tool with Rubber Boot - .95 Jaw Opening. Huskie EP-410 12 Ton Compression Tool with Rubber Boot - 1" Jaw Opening. Huskie EP-430 12 Ton Compression Tool with Rubber Boot - 1.2" Jaw Opening. Huskie EP-510C 12 Ton Compression Tool with Rubber Boot - 1.65" Jaw Opening.